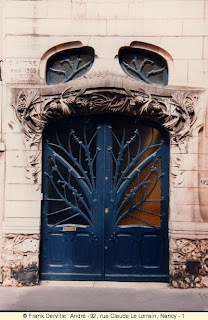 This is a door from a building in Paris. I was not able to find the architect or the year it was erected, but I thought it was a perfect example of art nouveau. The curves of the protruding concrete canopy are adorned with various organic shapes. The way the light drenches concrete accentuates the curves of the vines that are raised throughout the upper part of the door. The door consists of bent steel that resembles a tree-like figure. This figure is carried on in the two windows above the door. The shape of the door seems to be curved towards the top and even the windows up above are curved as opposed to a traditional rectangular window with sharp edges. By using new technologies of bending wire and sculpting, the architectual artists were able to showcase the beauty of nature and its organic forms. Without these new technologies it would not be possible to create these forms, which is the genius of this style of art. The importance of nature is being brought out by modern (man-made) technologies of the time. The organic and inorganic now become dependant on each other. Without nature, the architects of the time would not be able to show off the new technologies of bending wire and sculpting organic forms; in return, without technology, nature would not be able to take the form of an inorganic structure.